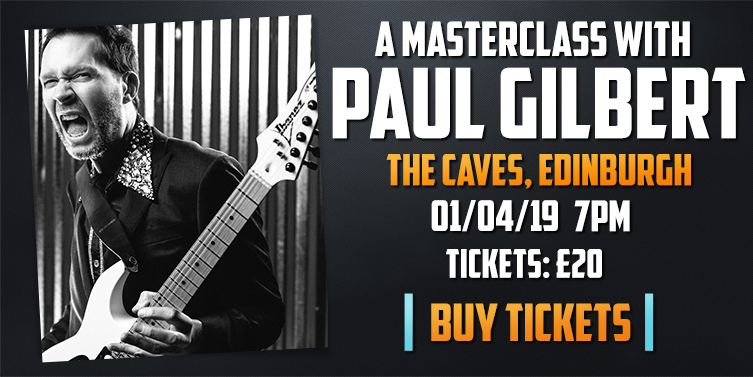 On the 1st of April (01/04/19, 7:00 PM), we're VERY pleased to share that Paul Gilbert is returning to the Caves in Edinburgh for an exclusive Masterclass. If you were lucky enough to make it along to our last event, you'll already know how epic it was but if not, trust us when we say that you're in for a real treat. Paul will be joined by his live band and will be running through a selection of his most classic songs, explaining his playing techniques and arrangements while he's at it. With the opportunity to ask questions and maybe even join Paul onstage for a jam if you're lucky, we'd encourage any shredders out there to grab tickets now and join us for what promises to be a seriously special event! Please note, this event is for over 18's only. Can't wait? Check out the first of Paul's brand new Artist Works series alongside Marshall Amps which are designed to help you learn, practice and master guitar techniques!